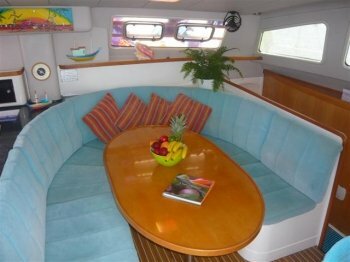 Welcome to EXTASEA 2 which operates their BVI all inclusive crewed yacht charters out of Tortola. 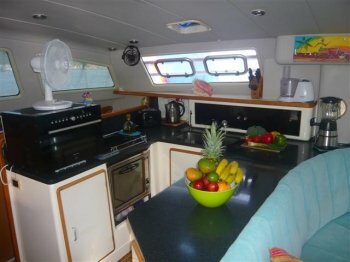 Looking for a Beautiful Boat ? Looking for an exotic getaway in Paradise? 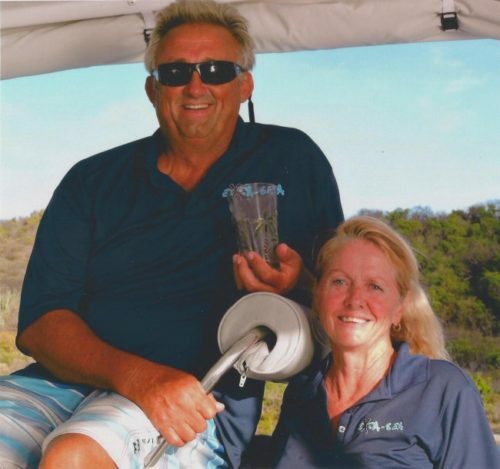 Let Mike and Lesley welcome you to EXTASEA 2, a luxury Owner-Operated Leopard 46 Catamaran, which was voted Cruising Boat of the Year. Enjoy your dream vacation in our Feel-at-Home friendly atmosphere, enjoying tropical drinks and fabulous food while you discover idyllic bays, white beaches, and beautiful islands. Snorkel in crystalline waters, Scuba dive tropical reefs and famous shipwrecks, or partake in the various water-sport thrills. 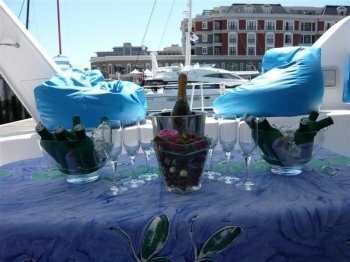 Or simply relax and get a tan while your personal chef and skipper spoil and pamper you. 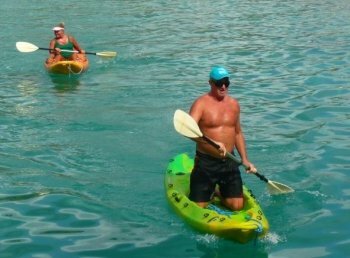 A BVI itinerary is extremely flexible and the cruising grounds present a myraid of opportunities. Let us show you a good time in the islands. There’s an array of exciting things to do within the islands,and a range of fabulous Caribbean beaches to enjoy, each with its own special character and vibe. Together with your skippers advice, we will plan a holiday of a lifetime according to where your wishes and the weather takes you. 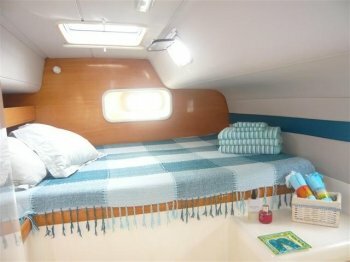 SLEEP ABOARD: $225 per cabin, minimum 2 cabins. Boarding 4PM or later, welcome cocktails and canapes provided. Dinner that night is ashore at client expense. Minimum 6N charter and excludes Christmas and New Years. Diving Costs: $35 per person per dive for certified divers. 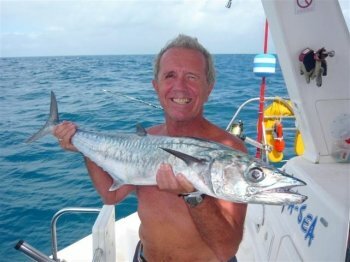 Mike is a qualified RYA Yachtmaster with over 50,000 sea miles under his belt. Together they have sailed and explored the Indian, Atlantic and Pacific Oceans. It gives him great pleasure to assist a total novice in getting up and sailing with a little guidance and encouragement. He is also a qualified Padi Dive Master, and will happily assist certified divers on planning their dives and accompany them as their guide. As an accomplished water-skier, and surfer he will soon have you up and riding on your water sports of choice. 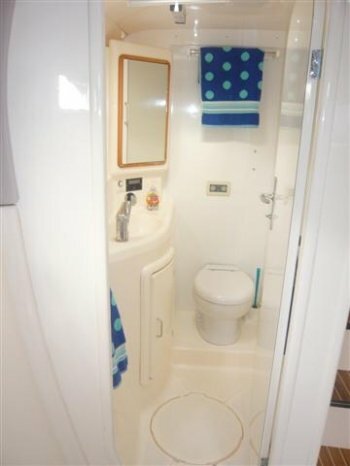 He is very competent in maintaining and running all aspects of his yacht. His warm and giving personality, love of life, sense of humor and honesty make him a great captain to sail with. His “generous” barman’s skills and great tales will have guests laughing into the night. He’s also a great DJ. 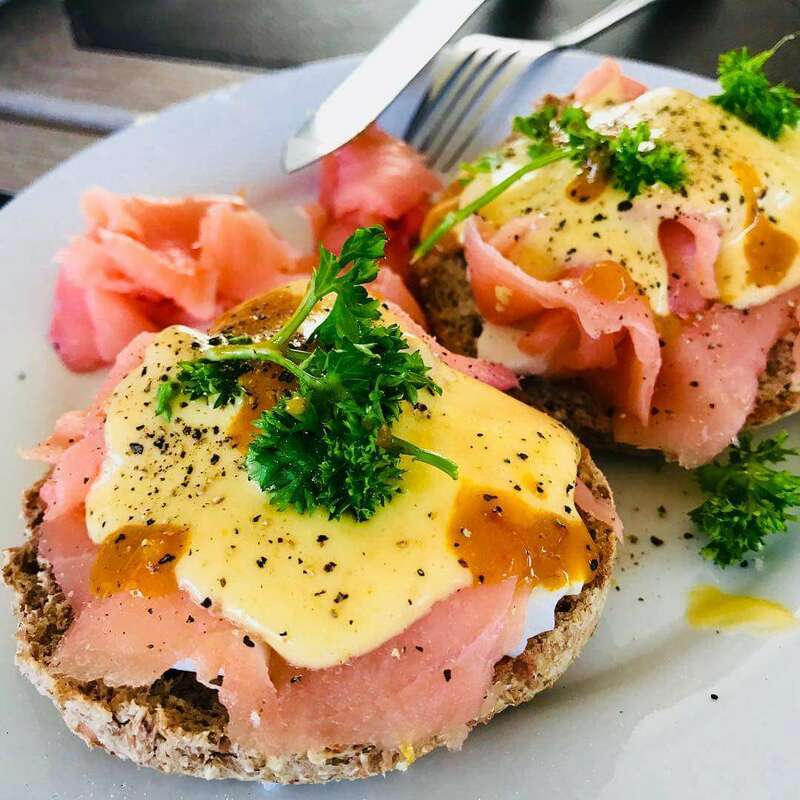 A great cook – who’s skills in the galley will delight you. 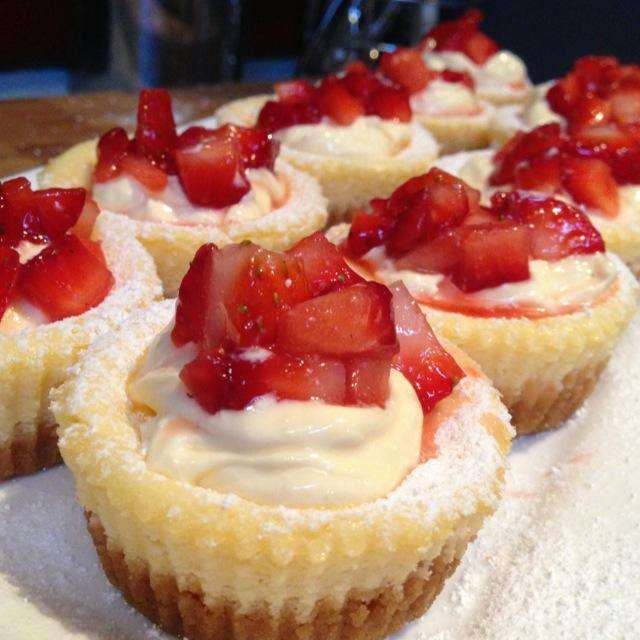 Her wonderful cuisine, reflects favored dishes from around world, varied and beautifully presented. A true Piscies, you’ll find her in the water as as much as on it. She will happily take you on guided snorkeling safaris, pointing out all the varied corals and fish found in the beautiful Caribbean waters. She is a natural earth mother, who enjoys children, is fun, easy going, helpful and resourceful. She will happily play surrogate “granny” to the kids, keeping them entertained and happy while you enjoy a scuba dive or a visit to one of the fabulous beach bars or restaurants on the islands. 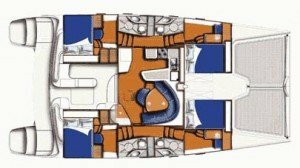 From the moment you board EXTASEA 2 she will make you feel relaxed and at home, while making sure your every need is attended to. My job requires that I travel quite a bit. So, I have had a chance to see a good part of the world and vacation as frequently as I am able to. There is no trip I have taken that even approaches this one. I spent a week on EXTASEA with Mike, Lesley, and my 14 year old son as a “boys trip” before high school starts. Mike and Lesley are 2 of the most welcoming, lovely people you could ever hope to meet. Within a day on the boat, you feel like family. Lesley could be a chef at a 5-star resturant anywhere if that is what she desired – every meal was incredible and was tailored exactly to our tastes. Mike is a fantastic captain, who enjoys sharing his knowledge of sailing (and letting you participate if you want to learn). He is always looking to make each day what you want it to be as guests….we changed our itinerary 3 times during the week as the vacation moved along and Mike didn’t mind a bit. 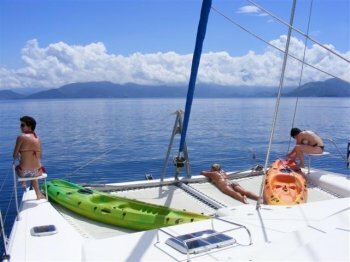 You can make this a “relaxing, lounge on the boat” vacation to one with kayaking, stand-up paddle boarding, tubing, kneeboarding, scuba diving (Mike is a dive master and knows the dives sities in the BVI very well) etc., or anywhere in btween. My son and I walked on the boat knowing how unique of a vacation this was going to be. We walked off feeling like we had made 2 new close friends who gave us the vacation of a lifetime. For us, its not a matter of “if” we will go again,,,its just a matter of “when”…and it can’t be soon enough. Thank you so, so muc for an amazing week aboard EXTASEA2. It exceeded any and all expectations. The food was delicious, like eating in a 5 Star restuarant at every meal! The snorkeling was amazing and every view breathtaking! Most of all you make us feel so comfortable at the get go! Wonderful week with you both, thank you for the terrific food, venues and diving advice. Your sailing expertise and knowledge of the BVI Pre and Post Irma, brought it all to life for us. Smooth sailing to you both – till wee meet again. Mike and Lesley were tremendous in their hospitality and friendliness. We sailed the BVI’s with them for a week and it was truly a memorable trip. Lesley is a fabulous cook…we all went home a little heavier…and Mike was the nicest host. You wanted for nothing on board during the entire trip. 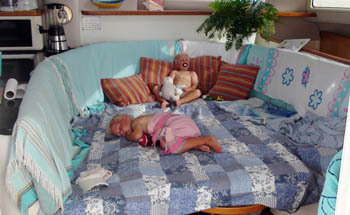 We had a great time snorkeling/diving, the cat is fully equipped, and the accomodations were spectacular. We’ve sailed many times down in the BVI’s and we will certainly go back and spend some time on this boat with the two of them again. We had a brilliant time, it really was a very special holiday. We all loved it, including the boys, and at 16 and 13, that is not always an easily done! They really put Mikes tender through its paces with endless wakeboarding etc. Mike and Lesley were absolutely great, very relaxed and perfect hosts. Lesleys food was wonderful and Mike was just great and so patient with our endless activities. I couldnt recommend them highly enough. 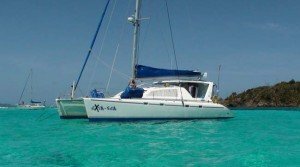 We were a group of two couples who spent a week aboard EXTASEA sailing around BVI. Our host, Mike and Lesley, were extraordinary. They made us fee welcome immediately and were an absolute pleasure. 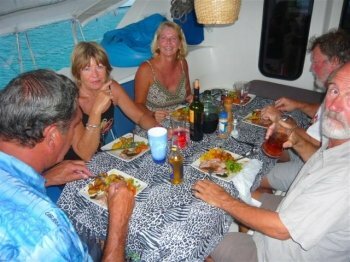 Mike’s exceptional sailing and nautical experience made us feel safe both day and night. Lesley is an excellent chef who amazed us three times a day with here delicous and well presented meals. Together, their hospitality and suggestions on where to go and what to do made our week in paradise even better. the BVI is georgeous, the weather is wonderful, and you cannot beat the beautiful colors of the Caribbean. Sailing on the EXTASEA, snorkeling, exploring island for a week in January was perfect in every way. 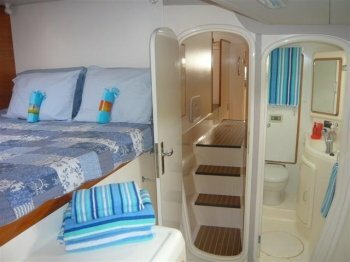 Highly recommended to anyone who is looking for a beautiful and relaxing vacation aboard a ship with delightful hosts. The customer service/meals we received the entire duration of our vacation was exemplary. Mike and Lesley welcomed us into their home and were an integral part of how well our vacation was, they never made us feel like we were in their way, or were asking too much. They got to know us as people and shared their family stories with us as well. Lesley is an outstanding cook, the food was amazing and Mike was a great Captain getting us to so many of the best locations within our 5 days. Mike has a great music library and isn’t afraid to turn up the colume and have some fun! Lesley brought us snacks at just the right time and both of them were laid back yet on top of every detail at the same time. Ask Mike to make you a margarita, he makes a mean one! It was truly the most fun & relaxing vacation of my life. Worth every penny!! I1d do it every year if I could. I miss Mike and Lesley already. Fabulous New Year at Sea! This was our second time on Extasea and for obvious reasons it won’t be our last. Mike and Lesley do a superb job in seeing that everthing is perfect down to the last detail. 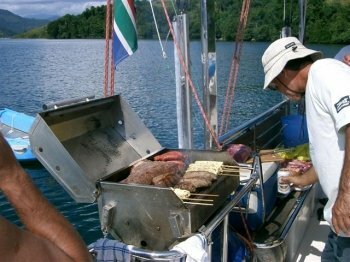 Leley handled the menu and prepared gourmet quality meals all Mike handled the diving and recreation. Libations we’re as requested and plentiful. The only disappointment is when the trip ends as once you’re there you simply wish it could go on forever. From first class accomodations to beautiful scenery this is an experience not to be missed. This past October I spent a week aboard the EXTASEA with my wife and some dear friends. This was truly an exceptional vacation. 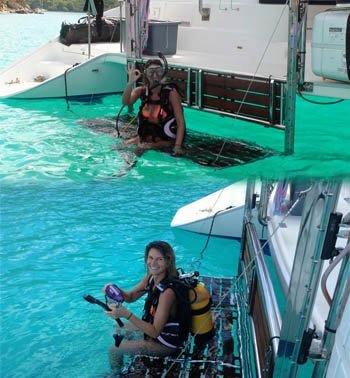 In fact, I can’t imagine a better way to experience the BVI. I also can’t remember a time that I returned home more refreshed and relaxed. What made this vacation so special were the hosts. Mike and Lesley are an impressive couple that truly posses a servants heart. The were both very friendly, knowledgeable, hard working, and had a great sense of humor! What a fun crew! One of the most impressive things about the vacation was the food. To say that Lesley is a fantastic cook would be a complete understatement. It is unbelievable how she can produce such marvelous dishes, with so much variety, out of a galley kitchen. She is truly girted. Overall, I don’t normally write reviews. I am making a exception this time as I feel the Mike and Lesley made this experience exceptional. If you going to the BVI, put EXTASEA at the top of your list and be prepared to be impressed. My husband and I have done 3 other charters before finding the Blameys and EXTASEA. We had a great time with Mike and Leley and were treated as family. 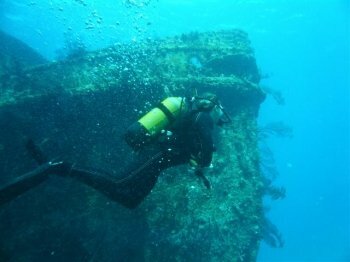 My husband has health issues, but still loves to dive. Mike made it as easy as possible and completely understood his limitations, This was such a relief and we knew we were in good hands. Both Mike and Lesley were very hospitable and made sure we wanted for nothing. Between Lesley’s awesome food and Mike’s drinks, we were always satisfied. We had excellent dives with Mike as well. We are planning to sail again with them next summer. MY son, friends and I went to the BVI for 8 days. The most extraordinary fabulous time was had by everyone. Michele Sparkes, New York City, New York. We have done several cruise ships and this was the first time sailing in a smaller environment. I don’t think we can ever go back on a Carnival Cruise ship again. Captain Mike and his wife Lesley are the best and are lovely people to be around. The food Lesley made for us was first class. On top of sailing we went fishing, scuba diving, snorkeling everyday. SUPaddle boarding, wake boarding and lots of good eating! We wnt Island hopping and a lot of relaxing time. If you do the math and fill the boat ths is a way better value than the biig cruise ships. I recommend the EXTASEA highly, and Mike and Lesley even HIGHER! !